According to the latest market study by International Data Corporation (IDC), smartphone shipments are expected to grow by 32.7 percent year over year in 2013, reaching 958.8 million units -- that's up from 722.5 million units in 2012. 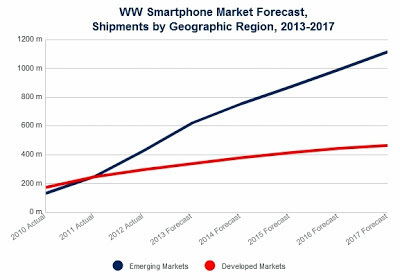 2013 will mark the first year that smartphone shipments surpass those of feature phones, with smartphones expected to account for 52.2 percent of all mobile phone shipments worldwide. IDC believes that this trend will continue as demand for mobile internet access spreads across both developed and emerging markets. In fact, emerging markets will account for 64.8 percent of all smartphones shipped during 2013 -- that's up from 43.1 percent in 2010. Strong demand from end users, greater emphasis by mobile service providers, and a deep selection of devices available from vendors at multiple price points are all contributing to smartphone adoption. In addition, user behavior has switched from simple voice telephony to digital content creation and consumption. As such, the smartphone has become the ideal communication tool for many users. "2013 will mark a watershed year for smartphones," said Ramon Llamas, research manager at IDC. "If you look at the number of vendors who support both feature phones and smartphones, many of them have not only successfully transitioned their product portfolios to highlight smartphones, but smartphones have become their primary value proposition going forward." In some cases, smartphones have accounted for well over 50 percent of vendor quarterly shipment volume. Looking ahead, IDC expect the gulf between smartphones and features phones to grow even wider. 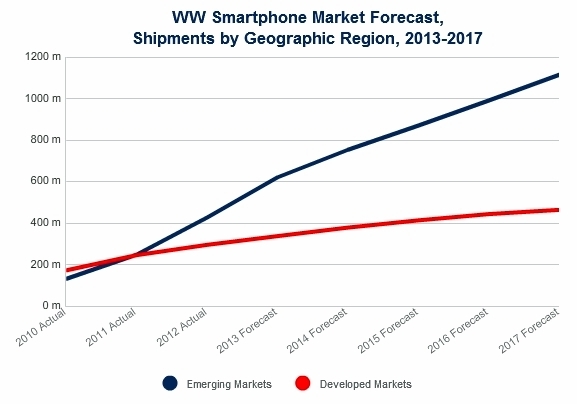 With the rise in global smartphone shipments, demand has quickly spread from developed markets to emerging markets. As a result, smartphone average selling prices (ASPs) have declined to $372 in 2013 -- that's down from $407 in 2012 and $443 in 2011. As this trend continues, smartphone ASPs are expected to drop as low as $309 by 2017 -- with emerging market demand the main catalyst in this change. Computing at such low end-user cost has posed many challenges to handset OEMs and component suppliers. At a time when the global smartphone market is growing at 33 percent year over year, average selling prices have plummeted, dropping -8 percent in 2012 with another -9 percent expected this year. One way in which vendors have managed to keep costs down is by continuing to produce 3G smartphones alongside faster 4G smartphones. Using older radio components has proven to be an easy cost-cutting measure for handset OEMs in the smartphone space. Moreover, 3G-enabled smartphones will account for 70.9 percent of all smartphones shipped in 2013, and 50.1 percent of smartphones shipped in 2017.